Mark Morton, left, and Karl Erb display gifts they were given in recognition of their 40-year careers at The Resource Center: framed newsletter articles about them. Morton’s is from 1986 while Erb’s is from 1994. About 140 people were recognized for their years of dedicated service to improving the lives of people with disabilities when The Resource Center held its 34th annual Employee Service Recognition Luncheon. 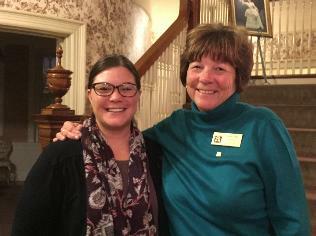 The event, held January 15 at the Chautauqua Harbor Hotel in Celoron, honored employees and members of the board of directors who, during 2018, reached milestone years of service with The Resource Center. 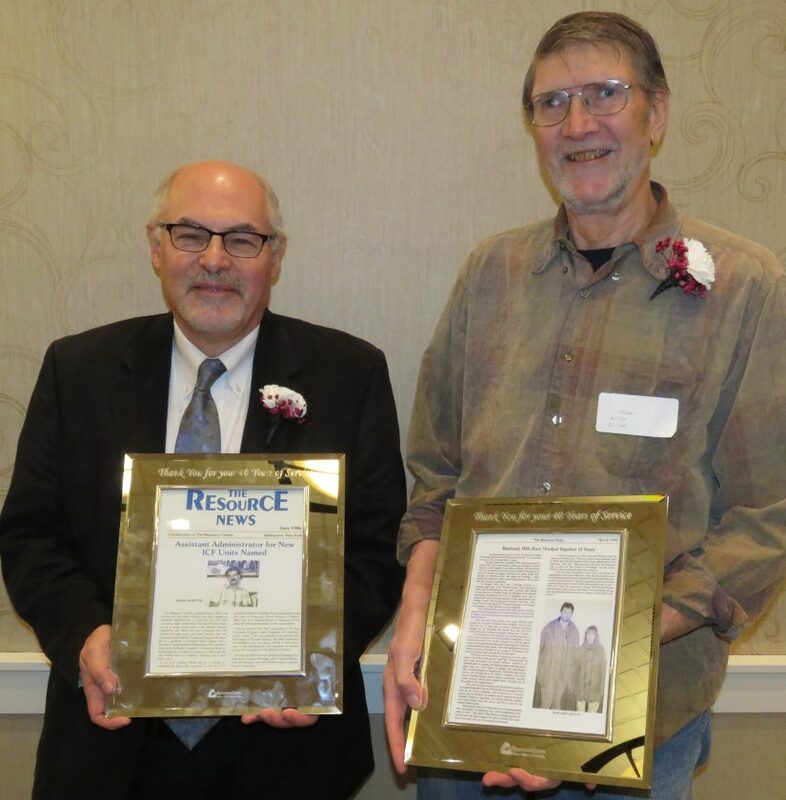 The longest-serving employees recognized at this year’s event were Karl Erb of Mayville, a direct support professional (DSP) aide in TRC’s day habilitation program on Lake Shore Drive in Dunkirk, and Mark Morton of Jamestown, assistant executive director for employee relations. They both have been working at The Resource Center for 40 years. Honored for 35 years of service with TRC were Linda Braun of Jamestown, supervising nurse; John DePane of Jamestown, staff development specialist; Jennifer Frederick of Jamestown, residence manager; and Deborah Rapp of Jamestown, day services supervisor. “I love what I do every day when I get up in the morning, and it’s because of the people we support and certainly the people I’ve been honored to work with,” DePane said. Employees recognized for being with the agency for 30 years were Dr. Robert Ellis of Stockton, senior psychologist; Rebecca Mirek of Dunkirk, day services supervisor; George Mitchell Jr. of Jamestown, maintenance helper; and Karen Moynihan of Ashville, transportation manager. Those completing 25 years of employment were Faith Baker of Jamestown, employment services administrator; Roselle Cash of Brocton, direct support professional (DSP) lead; Pamela Cranston of Westfield, dental assistant; Debra Hall of Bemus Point, DSP careerist; Bruce Main of Jamestown, case manager; Cynthia Neu of Jamestown, manager of personalized recovery-oriented services; Philip Opeil of Forestville, production maintenance technician; Barry Simmons Jr. of Jamestown, mechanic; Philip Thomas of Jamestown, residence manager; Suzanne Tracy of Sinclairville, day services supervisor; Donald Traynor of Bemus Point, staff development specialist; Steven Waterson of Jamestown, community relations director; and Kristen Wilson of Jamestown, DSP lead. Recognized for 20 years of service were Shawn Avery, Jamestown, community coach; Lela Berry, Panama, residence coordinator; Frances Carlson, Mayville, secretary; Leslie Fickling, Celoron, family care/self-advocacy coordinator; Katrina Gibson, Jamestown, DSP careerist; Wendy Giunta, Jamestown, RC; Ke-Khee Greenough, Silver Creek, mental health clinician; Beverly Heglund, Jamestown, community coach; Robert Sherbine, Jamestown, DSP lead; Jessica Smith, Jamestown, residence coordinator; Jill Suter, Jamestown, day services supervisor; and Karen York, Jamestown, DSP aide. Honored for 15 years of service were Sondra Apperson, Jamestown, DSP lead; Joanne Bevan, Erie, assistant executive director for program operations; Christine Burger, Jamestown, DSP aide; Jennifer Clark, Dunkirk, DSP careerist; Angela Dalrymple, Bemus Point, DSP careerist; Ernest Green Jr., Falconer, licensed practical nurse (LPN); Troy Hicks, Jamestown, general aide; Christopher Howard, Jamestown, nurse manager; Dr. Todd Jacobson, Jamestown, board of directors; Lynn Ling, Lakewood, DSP careerist; Erin Lutgen, Jamestown, DSP lead; Thomas Mabes, Stockton, maintenance specialist; Maria Martinez, Jamestown, general aide; Pennifer McCartney, Mayville, community coach; Alberta Monagle, Jamestown, DSP lead; Brandey Oakes, Lakewood, integrated site manager; Jennifer Peters, Jamestown, industrial specialist; Lisa Peterson, Falconer, residence manager; Tammy Sawyer, Cherry Creek, DSP; Kimberly Scoma, Jamestown, site supervisor; Barbara Stewart, Jamestown, board of directors; Julie Swanson, Lakewood, internal auditor; Tina Uber, Jamestown, DSP careerist; and Julie Vogan, Jamestown, residence coordinator. Completing 10 years of service in 2018 were Dustin Allen of Jamestown, DSP careerist; Sandra Biggers, Sinclaurville, residence manager; Cherie Bunce, Corry, coordinator of nursing services; Bonnie Clark, Jamestown, LPN; Christopher Clark, Jamestown, DSP aide; Katie Cleland, Jamestown, medical aide; Rita Cybulski, Jamestown, DSP aide; Yvonne Gilbert, Dunkirk, lead manufacturing supervisor; Stacy Harrington, Mayville, residence coordinator supervisor; Shawn Johnson, Jamestown, DSP lead; Lori Lang, Warren, site manager insurance specialist; Tammy Mancuso, Jamestown, cook; Danny Mealy Sr., Jamestown, industrial specialist; Dr. Adnan Munir, Lakewood, physician; Elizabeth Nuhfer, Jamestown, DSP careerist; Kelly Patterson, Jamestown, DSP careerist; Gwen Sample, Jamestown, accounts payable clerk; Noelle Saulter, Buffalo, DSP lead; Laura Seiberg, Bemus Point, nurse manager; Haeden Smith, Ashville, DSP aide; Tabatha Stenstrom, Jamestown, life coach; LeeAnn Sunderlin, Jamestown, DSP aide; Connie Truax, Sinclairville, cook; Rita Varney-Smith, South Dayton, case manager; Andrea Vullo, Frewsburg, bookkeeper; Shelly Williamson, Dunkirk, DSP lead; and Philip Wright, Ashville, behavior technician. Recognized for five years of service were Tanya Baker, Jamestown, general aide; Leslie Bamburoski, Lakewood, residence manager; Courtney Beckerink, Jamestown, self-determination assistant; Angelica Camacho, Jamestown, LPN; Scott Cappa, Jamestown, community coach; CodyAnne Chambers, Ripley, employment facilitator; Melinda Covell, Kennedy, certified occupational therapy assistant; Amy Curtin, Bemus Point, DSP lead; Jonathan DeSantis, Jamestown, health coach; Jennifer DeWolf, Sheridan, DSP careerist; Jennifer Diaz, Dunkirk, patient registrar; Leslie DiNapoli, Jamestown, accounts receivable clerk; Brittany Dorman, Dunkirk, community coach; Stefanie Gifford, Lakewood, residence manager; Kenley Goodwin, Jamestown, DSP lead; David Gowan, Jamestown, DSP careerist; Paige Green, Kennedy, general aide; Valery Guerrero, Brocton, DSP aide; Donna Haenggi, Lakewood, board of directors; Samuel Hicks, Ashville, DSP lead; Kaylie Himes, Cattaraugus, DSP careerist; Edythe Johnson, Jamestown, community coach; Janice Johnson, Lakewood, human resources specialist; Charles Klenke, Jamestown, purchasing agent; Joseph Koterass, Kennedy, LPN; Bethanne Landy, Celoron, driver; Melissa Lauffenburger, Frewsburg, LPN; Coryn Majck, Fredonia, self-determination assistant; Amanda Majewski, Mayville, site supervisor; Dante Moore, Panama, DSP careerist; Kenneth Moskwa, Jamestown, cook; Lacie Munson, Jamestown, LPN; Megan Nation, Randolph, job coach; Aliza Neal, Frewsburg, job coach; Tara Nitkiewicz, Sherman, residence coordinator; Lynford Osgood, Jamestown, assistant residence manager; Michelle Pattison, Cassadaga, day services supervisor; Patricia Perlee, Jamestown, board member; Todd Rapp, Jamestown, registered nurse; John Rogers, Falconer, production maintenance technician; Lisa Roland, Forestville, DSP lead; Allison Rounds, Falconer, patient access specialist; Jodi Sadlowe, Jamestown, accounts receivable specialist; Alice Sanchez, Falconer, lead manufacturing supervisor; Gina Sink, Jamestown, applied behavioral science specialist; Ada Sommers, Kennedy, community coach; Joshua Straight, Jamestown, business systems analyst; Lexi Stroebel, Mayville, medical aide; Shannon Studd, Jamestown, human resources specialist; Shelby Surrena, Frewsburg, behavior intervention specialist; Carl Swanson, Jamestown, community coach; and Linda Ward, Lily Dale, licensed certified social worker. Employees were called forward one at a time to be thanked for their years of dedicated service. Staff with 15 or more years at The Resource Center received a monetary award and a gift (40 years – picture frame; 35 years – clock; 30 years – paperweight; 25 years – pen and letter opener; 20 years and 15 years – jacket or fleece). Employees with 10 or five years of service received a jacket or a fleece. Welcoming remarks were given by Morton. Remarks also were made by Executive Director Denise Jones and R. Michael Goldman, board president. Jones said she was not aware of any other organization that takes time to honor so many of its employees on an annual basis. “It’s always striking, the teamwork that we have here, and all of the history that we have as an organization. For more information about The Resource Center, phone 483-2344 or visit the web site, www.resourcecenter.org.